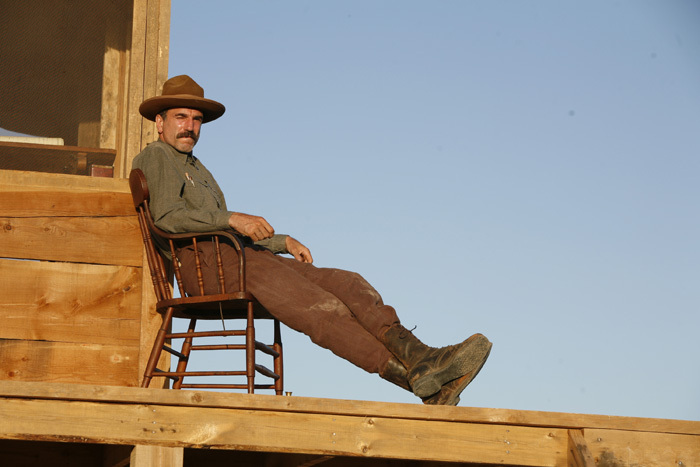 Paul Thomas Anderson wears his influences and inspirations on his sleeves. His previous three films have all operated under the heavy shadow of Martin Scorsese (BOOGIE NIGHTS), Robert Altman (MAGNOLIA) or Jonathan Demme (PUNCH-DRUNK LOVE). His latest film, THERE WILL BE BLOOD, though it has other antecedents, seems like Anderson’s attempt to do a remix job on Stanley Kubrick. Ya gotta say this much for PT — he only steals from the best. And right from the very start. The very first shot of BLOOD plonks us into 2001 territory — a rocky landscape in untouched nature, accompanied by music that so sounds like Gyorgy Ligeti’s famously-strange dissonant modernism (You can hear it as the film’s Web site starts to load) that I was surprised to learn later that it was not Ligeti. Instead, the virtuoso score is all-original work by Jonny Greenwood, who just as often turned out themes in completely different styles like Bernard Hermann with the high-pitched fast strings here, Michael Nyman with the legato weeping-strings passages here and here, and some of Giovanni Fusco’s work for Antonioni here. (The soundtrack is an obvious steal at any price here.) Other sound touches that Stan the Man would have been proud of include the impressionistic use of silence on the soundtrack. The explosion that deafens a character in BLOOD reminded me of the deadness of space in 2001, and its blending into sound as Dave comes back into Being and re-enters creation on the Discovery. Like in 2001, a lengthy, wordless sequence of maybe 20-25 minutes begins the proceedings, only instead of apes escaping nature through the discovery of tools, we see a man, Daniel Plainview, prospect for oil. He starts out as a tradesman, a genuine wildcatter before he really becomes a “businessman.” In this sequence, the basic threads, setup and motifs are laid out. The trailer at the film’s site gives you more of an impression that Day-Lewis is imitating John Huston in CHINATOWN. But that’s mostly voice — it gives no indication of either pitch or body language,where the primary influence is Jack Nicholson from THE SHINING, particularly when he cracks up near the end, something Noah Cross never does in CHINATOWN. And appropriately, Lewis in the dialog-free beginning also had more of Nicholson and also the feral quality of the 2001 apes. Kubrick always wanted Big, conceptual performances from his actors and Day-Lewis can do that without collapsing into caricature better than anyone today (I weep to think what he could have done under Kubrick’s direction). It’s no surprise to me than Dan Sallitt, with whom I’ve butted heads on “Kubrick acting” before, didn’t care for this movie.